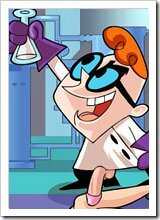 Dexter carefully put a single drop of yellow liquid into a large beaker of blue liquid. The formula instantly turned red and when it didn’t explode, a smile spread on his face. “I have done it, my greatest invention ever is finished.” He held the bottle up triumphantly for a minute and smiled. The bottle was snatched out of his hands and he stared around his lab in surprise. Dede was holding the bottle and stared at the liquid. “Pretty colour.” She said in her high pitched voice. “Dede, please be careful. That is my latest triumph. It is the consequence of forty eight hours of work and if you destroy it now I will introduce you to the working end of my plasma rifle.” Dede giggled and put the bottle down, but wouldn’t take her eyes off of it. “What does it do Dexter?” Deter sighed and moved the bottle out of her reach. “If you must know, you simpleton. It is a formula to avoid plastic surgery. Once imbibed, this liquid will alter a person’s genetic structure and purify it. It will rid a person of the genes that give them bad acne, or weight problems and transform them into, what in genetic terms could be considered, a perfect human. Plastic surgeons would pay me millions just to keep this formula off of the market. But I intend to sell it and make billions.” He laughed maniacally. Dede watched him make his speech with a bored expression on her face. 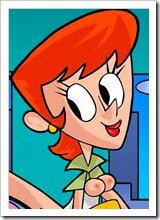 “Uh-huh, does it work?” Dexter stopped laughing and stared at Dede angrily, trust her to find a way to spoil his celebration. “No, as of yet a test upon a human subject has not commenced. But such a test is being premeditated.” He began to move away, onto the next experiment. “Now, you obtuse woman, depart from this location and leave me in peace.” Dede ignored him and continued to stare at the liquid. Dexter activated his computer and began to type in a long equation. Next project, a working warp drive. He was going to show that it could be built and he would make millions selling the design to NASA, billions for a working prototype. It would be delicate work, his most challenging to date. But he felt he was up to the task. “Lets see, perhaps generating a micro-black hole and manipulating the gravity field. Yes, that would work. Why bother pushing the ship through space, when you can just bend space and bring your destination to the ship.” He began to type away at an equation that would make both Einstein and Hawking turn and say ‘could you put that in simple terms?’ But to Dexter and his super computer, it made perfect sense.